Dr. Douglas Palmer joined Walsh University in the Fall of 2005 and currently serves as the Vice President for Academic Affairs and Provost, as well as Dean of the University. Prior to this, Dr. Palmer was the Assistant Dean of Academic Innovation and an Associate Professor of History. In 2004-2005, he was a Research Fellow at the Emory University School of Law and he holds a Ph.D. from Ohio State University, an MA from the University of Oregon, and a B.A. from the University of North Carolina-Asheville. In 2001-2002, Dr. Palmer was a Fulbright Scholar in Utrecht, the Netherlands. 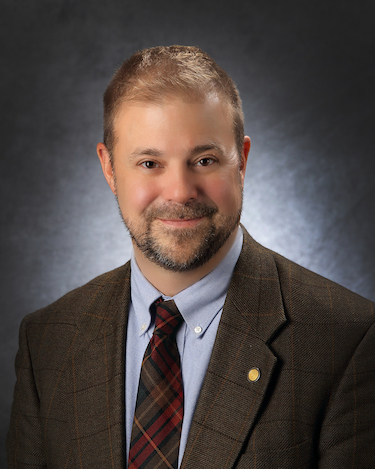 Dr. Palmer teaches classes in European history and his research focuses on European cultural and political history, in particular the history of Great Britain. In 2011, he published "The Brewers' Lament: Porter and Politics in Late Seventeenth-Century England" in the journal The Historian. He is currently working on a project examining issues of food security in the British Empire. He and his wife Catherine are both from Pittsburgh, PA . They have three sons. Palmer, Douglas B., "The Brewers' Lament: Porter and Politics in Late Seventeenth-Century England," The Historian 73 (2011): 1-21. Book Review of Martine Julia van Ittersum, Profit and Principle: Hugo Grotius, Natural Rights Theories and the Rise of Dutch Power in the East Indies, 1595-1615. In The International Journal of Maritime History (Fall 2006). Book Review of Alan Forrest, Paris, the Provinces and the French Revolution, in The Historian 68 (2006), p. 184-85. "Contract Law" and "Sacred Law," Berkshire Encyclopedia of World History (Great Barrington, Mass: Berkshire Publishing, January 2005). With Dale Van Kley, "The French Enlightenment: Practical Reformers, Naïve Utopians, or Dangerous Libertines" in Exploring the European Past: Texts and Images, ed. Timothy E. Gregory (Stamford, Conn.: Thomson Learning, 2002). "Sacred Heart and Sociability; The Clerical Elite of Eighteenth Century Jansenism," presented at the European Social Science and History Conference, Amsterdam, the Netherlands, March 2006. "The Miraculous Cure of Agatha Stoudhandel: Dutch Jansenism and the Origins of the Catholic Enlightenment," presented at the American Society for Church History Conference: Savannah, GA, March 2005. "The 'Little Church of Utrecht' and the Formation of a Catholic Public Sphere in the Age of Enlightenment," presented at: Pietism in Two Worlds: Transmissions of Dissent in Germany and North America, 1680-1820, sponsored by the German Historical Institute, Atlanta, GA, March 2004. "From a National Church to International Unity: The Civil Constitution of the Clergy and International Jansenism," presented at the Society for French Historical Studies Conference: Milwaukee, WI, April 2003. "The Jesuit Unmasked: The Dissolution of the Jesuits and the Jansenist Public Sphere," presented at the Ohio Academy of History: Akron, OH, April 2003. "Armand-Gaston Camus: Censor and Revolutionary," presented at the Northeast American Eighteenth-Century Studies Conference: Portland, ME, October 2000.